Truss rod: Standard. Fret size: Info not available. Neck width at 12 fret: Info not availableBody. Body finish: Nitro Lacquer Gloss. Case: Hardshell Tweed. Bridge type: Fixed. Bridge design: Standard. This listing is for a 2006 60th Anniversary “diamond” 4 String Jazz Bass in a sunburst finish with a rosewood fretboard. This J Bass is in fantastic condition with only finish “swirling” if you catch it in the right light. There are a couple small imperfections on the very top of the headstock if I had to point out some thing negative but barely noticeable at all. Plays wonderfully and sounds even better. The condition of this bass though is beautiful. Cool bass with some 60th anniversary history to it! Beautiful 2006 60th anniversary Fender Jazz Bass. Bass was polished, detailed. Bass will include a FREE used generic tweed but non Fender hard shell case. Bass is USED CONDITION. 1.-Bass/Guitar is fully described and I strive to do so. I ALWAYS explain it as accurate as I possibly CAN! 60 th Anniversary edition with case. USA serial number. Classic Vibe '60s Jazz Bass®, Laurel Fingerboard, Daphne Blue. Daphne Blue. Indian Laurel. Fingerboard Radius. Classic Vibe. Truss Rods. Jazz Bass®. Fender® Designed Alnico Single-Coil. • UPC: 885978854172. • Fingerboard: Pau Ferro. Tweed case included. • Color: 3-Color Sunburst. Strong, clear and versatile, it gave bassists everywhere a powerful new voice and a fast new feel that would only grow bolder in the decades that followed. Model, the quality on this model surpases almost every other Squier ever made. oiled, electronics and truss rod works nice and smooth. Bass will include a FREE New original Fender bass gig bag. GET IT WHILE YOU CAN BECAUSE THIS IS A GREAT BASS TO PLAY. Neck Plate: 4-Bolt Squier. -Body Material: Poplar. -Fingerboard Material: Indian Laurel. -Truss Rod: Head Adjust. -Body Shape: Jazz Bass. -Neck Material: Maple. -Bridge Pickup: Fender Designed Alnico Single-Coil. DC Resistance Bridge: 9.21 K. DC Resistance Neck: 8.77 K.
Color: 3-Color Sunburst. Body Shape: Jazz Bass®. Bass Guitars. String Nut: Bone. Body Finish: Gloss Polyurethane. Neck Finish: Tinted Gloss Urethane. (Bridge Pickup), Master Tone. Neck Shape: "C" Shape. New Gear: If you’re not satisfied, neither are we. It’s that simple. Check-Out Now! Full Manufacturer warranty not applicable on all used products. This thing just rocks, with a super easy action, and she sounds like a great jazz bass should! She's 100% original, and ready to rock! She was born in July of 2017, and is in perfect unplayed condition, with no play wear to report.The neck is straight, with no cracks or repairs… the frets are perfect, with their entire life ahead of them. and the sound is as sweet as it gets! Lacquer finishes lets the wood “breathe” naturally with resonant tone. Neck material: Maple. Fingerboard radius: 9.5". Solid alder body with gloss nitrocellulose finish. New Gear: If you’re not satisfied, neither are we. It’s that simple. The slim “’60s C”-shaped neck profile and 9.5”-radius round-lam rosewood fingerboard combine for an agile playing feel. Body Shape: Jazz Bass®. String Nut: Bone. (Bridge Pickup), Master Tone. Scale Length: 34" (864 mm). The slim “’60s C”-shaped neck profile and 9.5”-radius round-lam rosewood fingerboard combine for an agile playing feel. Color – 3-Color Sunburst. Body Finish – Gloss Nitrocellulose Lacquer. Neck Finish – Gloss Nitrocellulose Lacquer. Slim “’60s C”-shaped neck profile; 9.5”-radius round-lam rosewood fingerboard. 9 lbs 5 oz. Released in 1960, the Jazz Bass is the king of versatility and style. Nitrocellulose Lacquer 3 Color Sunburst Finish. Most of our guitars are individually photographed, and are set-up with care by our in-house luthier. Slim “’60s C”-shaped neck profile; 9.5”-radius round-lam rosewood fingerboard. Jazz Bass®. (Bridge Pickup), Master Tone. 4-Ply Brown Shell. Hardware Finish. Body Material. Remarkably comfortable, it suits any playing style. Slim “��60s C”-shaped neck profile; 9.5”-radius round-lam rosewood fingerboard. “’60s C” NECK SHAPE. Alder body with lacquer finish. LACQUER FINISH. The slim “’60s C”-shaped neck profile and 9.5”-radius round-lam rosewood fingerboard combine for an agile playing feel. Body : Alder. Fingerboard : Round-Laminated Rosewood. Fingerboard Radius : 9.5" (241 mm). Slim “’60s C”-shaped neck profile; 9.5”-radius round-lam rosewood fingerboard. 9 lbs 2 oz. 1960 Fender "Stacked Knob" Jazz Bass early 9/60 production 1 owner since 1962 ! 1960 Fender "Stacked Knob" Jazz Bass owned for 56 years by 1 owner ! Bill Miles playing his bass for 56 years like no one else ever has ! Truss Rod: Unknown. Model No. : JB62-60 Jazz Bass. Pick guard is missing. Seems to be manufactured around 1984-1987 from serial number. Serial No. : E 541845. This item is sold out everywhere in Japan and very hard to get it! 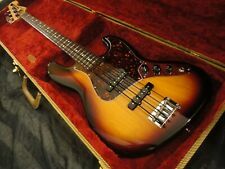 Fender 60s Jazz Bass Lacquer 4-Str Electric Bass 3-Color Sunburst w/ Case, New! Fender 60s Jazz Bass Lacquer - 3-Color Sunburst. Tweed case included. Color: 3-Color Sunburst. Strong, clear and versatile, it gave bassists everywhere a powerful new voice and a fast new feel that would only grow bolder in the decades that followed. Color: Olympic White. Jazz Bass®. Pictures Are Of Actual Bass! Truss Rod Truss Rod Nut (Bridge Pickup), Master Tone. Black Plastic. Product Prices, Features, Specifications and Availability Are Subject To Change Without Notice. New Gear: If you’re not satisfied, neither are we. It’s that simple. Check-Out Now! 4005 N Norfleet. Full Manufacturer warranty not applicable on all used products. The slim “’60s C”-shaped neck profile and 9.5”-radius round-lam rosewood fingerboard combine for an agile playing feel. Fingerboard Radius: 9.5" (241 mm). Body Shape: Jazz Bass®. Neck Material: Maple. If you’re not satisfied, neither are we. It’s that simple. item# 1500000152725. The slim -'60s C shaped neck profile and 9.5 radius round-lam rosewood fingerboard combine for an agile playing feel. • Color: Olympic White. • Body Shape: Jazz Bass®. • String Nut: Bone. (Bridge Pickup), Master Tone. Lacquer finishes lets the wood “breathe” naturally with resonant tone. Fingerboard radius: 9.5". Slim “’60s C”-shaped neck profile; 9.5”-radius round-lam rosewood fingerboard. Check for fret buzz. Finish/Color: 3-Color Sunburst. - Check action and adjust if necessary. - Check intonation and adjust if necessary. - Check for sound operation of pots and switches. - Test all electronics. New Gear: If you’re not satisfied, neither are we. It’s that simple. Check-Out Now! New Gear: If you’re not satisfied, neither are we. It’s that simple. Check-Out Now! item# 1500000152725.
fender®, Squier®, Stratocaster®, Telecaster®, Precision Bass®, Jazz Bass® and the distinctive headstock designs commonly found on the Strat®, Tele® & P Bass® guitars are registered trademarks of Fender Musical Instruments Corporation All In One guitars has been growing steadily and relatively fast in business for past three year in the music scean in the heart of LA. The CEO of All In One, "Jin-the-professional-guitar-aficionado" has been professional musician for over 40 years and has personally played plathera of guitars of all the different brands from very cheap to very expensive. Our set-up process is very intensive and very meticulous. Our highly trained luthier sets up the guitars with high-end specifications. UPC: 885978910571. Fingerboard: Pau Ferro. Tweed case included. Fingerboard Radius: 7.25" (184.1 mm). Strong, clear and versatile, it gave bassists everywhere a powerful new voice and a fast new feel that would only grow bolder in the decades that followed. It truly looks like it's out of 1960! Nitrocellulose Lacquer Faded Aged Lake Placid Blue Finish. Most of our guitars are individually photographed, and are set-up with care by our in-house luthier. (Bridge Pickup), Tone 1.